Background: Retinopathy lesions are fairly common findings in clinic settings and may predict risk of coronary heart disease (CHD). Objective: To examine whether retinopathy independently predicts a risk of CHD-related mortality in people with and without diabetes. Methods: In an Australian population-based cohort of people with (n = 199) and without (n = 2768) diabetes (Blue Mountains Eye Study, total n = 2967), the presence and severity of retinopathy was assessed from retinal photographs. 12-Year cumulative CHD deaths were ascertained from Australian National Death Index records. Results: Over 12 years, 353 participants (11.9%) had incident CHD-related deaths. Retinopathy was present in 57/199 (28.6%) participants with, and in 268/2768 (9.7%) without, diabetes. The presence of retinopathy increased the CHD mortality rate per person-year by an amount (0.005) equivalent to the presence of diabetes itself (12-year CHD mortality rate per person-year of 0.010 in people with neither diabetes nor retinopathy, 0.015 in those with diabetes alone, 0.016 in those with retinopathy alone). After adjusting for cardiovascular risk factors, retinopathy remained an independent predictor of CHD death both in people with diabetes (hazard ratio (HR) = 2.21, 95% CI 1.20 to 4.05) and in those without diabetes (HR = 1.33, 95% CI 1.02 to 1.83). Moderate retinopathy was associated with adjusted HR = 6.68 (95% CI 2.24 to 20.0) in people with diabetes and adjusted HR = 2.29 (95% CI 1.10 to 4.76) in people without diabetes. Conclusions: A finding of retinopathy in people with or without diabetes may signal increased CHD risk. The increased CHD mortality associated with retinopathy in people without diabetes was equivalent to the presence of diabetes itself. The retina is a unique site where the condition of the microcirculation can be non-invasively imaged. Recently, our group and others have shown that the calibre of retinal arterioles and venules conveys information that helps to predict the risk of coronary heart disease (CHD), independently of other risk factors such as age, hypertension, diabetes and smoking.1–4 These studies suggest that quantitative measurement of retinal vascular calibre, using computer-assisted methods, may be a new method of assessing CHD risk.1 However, this method is limited by the need for digital retinal photography, specialised computer programs and technicians to grade the images, as retinal vessel calibres cannot be reliably estimated in clinical practice by direct ophthalmoscopy. There is thus an important role for retinal vascular risk markers that could easily be detected using currently available tools in a clinical setting. Retinopathy lesions (microaneurysms, haemorrhages, cotton wool spots, hard exudates) are well known to doctors, and can be reliably detected using the direct ophthalmoscope available in most emergency departments and doctors’ offices.5 People with diabetes have regular fundus examinations in order to detect sight-threatening retinopathy lesions in a timely manner. 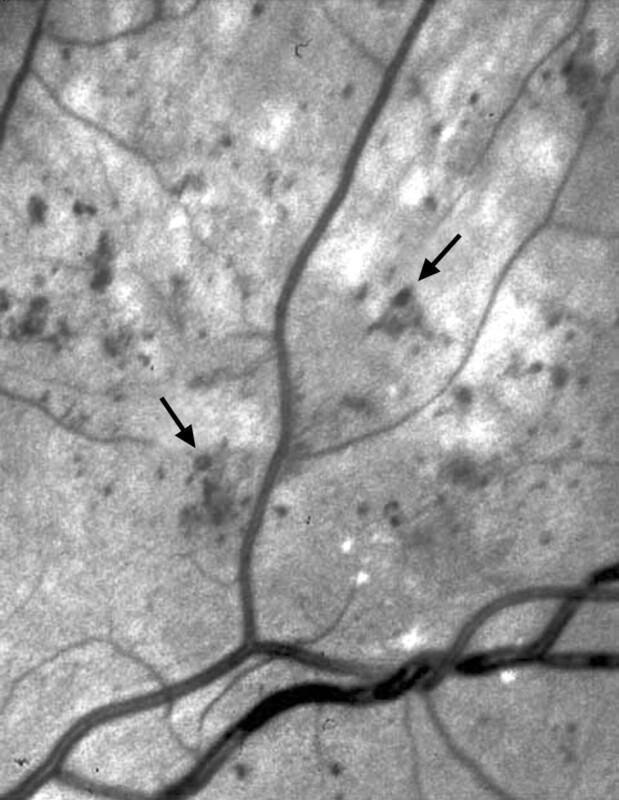 Recent work indicates that the presence of retinopathy not only signifies greater risk of vision loss but also a two- to threefold excess risk of CHD, even after accounting for other cardiovascular risk factors.6–11 There is now growing evidence that these same retinopathy lesions typical of diabetes (particularly microaneurysms and haemorrhages) are common fundoscopic findings in older people without diabetes or impaired glucose metabolism.12 13 However, whether these retinopathy lesions also convey the same increased risk of CHD in people without clinical diabetes as they do in people with diabetes is not known. This is of clinical importance as 10% of the general population have retinopathy lesions12 13 which can often be detected by direct ophthalmoscopy, but for which the prognostic significance is still uncertain. Only one study has examined the prognostic implications of retinopathy lesions in people without diabetes. This study, the Hoorn study,14 reported a suggestive association of retinopathy with all-cause and cardiovascular mortality in people without diabetes, but this finding was not statistically significant owing to a limited sample size (n = 44 with retinopathy). As retinopathy lesions in people with diabetes are associated with abnormalities in the coronary circulation,15–18 and the same retinopathy lesions are present in people without diabetes,13 we hypothesised that retinopathy lesions would predict CHD mortality in people with and without diabetes. We tested this hypothesis in a large population-based study of people with and without diabetes. Figure 1 Moderate retinopathy. Arrows point to haemorrhages, while microaneurysms are smaller circular lesions. We confirmed deaths and causes of death from the Australian National Death Index (NDI) as described elsewhere.2 4 Causes of death in the NDI database are collected from death certificates, which are completed by the doctor in attendance, coroner or medical examiner, regardless of whether the death occurred in a hospital or in the community, and recorded using International Classification of Diseases (ICD) codes. CHD death was defined using the following codes from ICD-9 (410.0–9, 411.0–8, 412, 414.0–9) and ICD-10 (I21.0–9, I22.0–9, I23.0–8, I24.0–9, I25.0–9).4 The validity of Australian NDI data has been reported to have high sensitivity and specificity for cardiovascular mortality (92.5% and 89.6%, respectively).21 The census cut-off point for CHD death was 31 December 2005 (12-year follow up). At baseline, retinopathy was present in 57/199 (28.6%) participants with, and in 268/2768 (9.7%) without, diabetes. Figure 2 shows that CHD mortality increased progressively in people with diabetes alone (14.8%), to retinopathy alone (16.8%), and was highest in people with both diabetes and retinopathy (19.3%). The presence of retinopathy alone in people without diabetes increased the CHD mortality rate by an equivalent amount (0.006 per person-year) as the presence of diabetes itself, without retinopathy (0.005 per person-year). Similarly, the presence of retinopathy in people with diabetes increased the rate of CHD death by an additional similar amount (0.006 per person year) over and above that associated with diabetes itself. The attributable risk for CHD from retinopathy is thus similar to the attributable risk from diabetes. After adjusting for cardiovascular risk factors, retinopathy remained an independent predictor of CHD death in people with (HR = 2.21, 95% CI 1.20 to 4.05) and without diabetes (HR = 1.33, 95% CI 1.02 to 1.83). In both people with and without diabetes, increasing severity of retinopathy was associated with greater risk of CHD death. In people with diabetes, mild and moderate retinopathy were associated with adjusted HR = 1.50 (95% CI 0.54 to 4.19) and HR = 6.68 (95% CI 2.24 to 20.0), respectively (p for trend = 0.002); while in people without diabetes the corresponding adjusted HRs were 1.21 (95% CI 0.85 to 1.72) and 2.29 (95% CI 1.10 to 4.76), respectively (p for trend = 0.03). Figure 2 Coronary heart disease (CHD) deaths over 12 years, by diabetes and retinopathy. *Adjusted for age (continuously), gender, smoking (current, past and never), hypertension and diabetes. 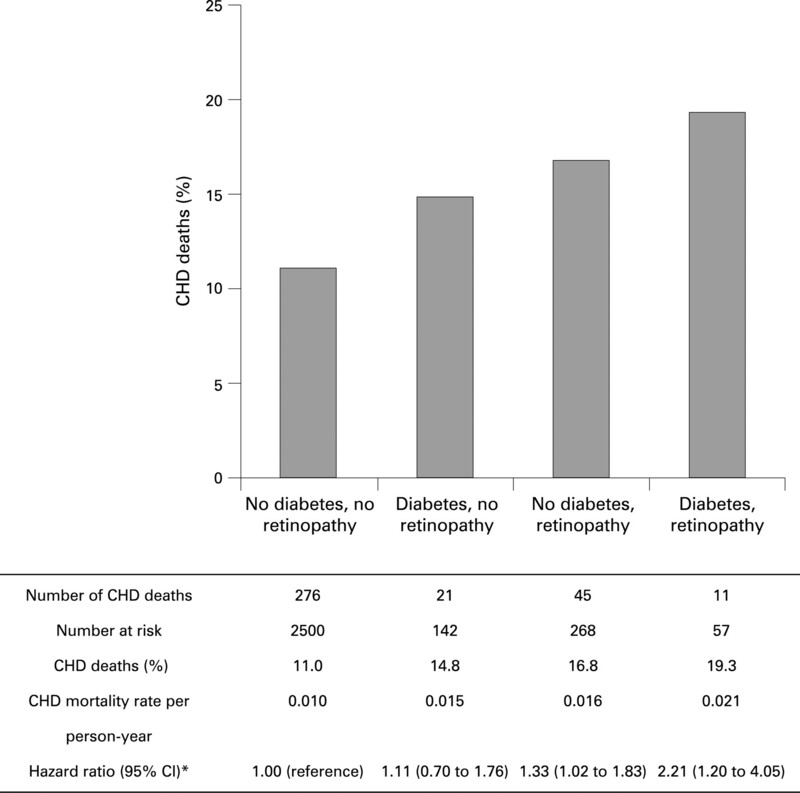 Among people with IFG (n = 319), 33 (10.3%) had retinopathy, which was not associated with CHD death (HR = 1.10, 95% CI 0.41 to 2.69, data not shown). After excluding people with diabetes or IFG, there were 2449 people with normal fasting glucose, 235 (9.6%) of whom had retinopathy, which remained predictive of higher CHD mortality (HR = 1.41, 95% CI 1.00 to 1.99, data not shown). Additional adjustment for body mass index, fasting plasma glucose, oral hypoglycaemic drugs and serum creatinine level did not change the results appreciably. Associations were similar in men and women. Our findings show that retinopathy is associated with CHD mortality in people with and without diabetes. Other studies have reported consistent associations of retinopathy with increased CHD risk in people with diabetes, but our study may be the first to report a similar association in people without diabetes. Interestingly, the additional increased risk associated with retinopathy in people without diabetes was similar in magnitude to the presence of diabetes alone. The Hoorn study,14 the only other study to examine the association of retinopathy with CHD in people without diabetes, reported similar findings that retinopathy in both people with and without diabetes predicted 10-year cardiovascular mortality, although the association was only significant in people with diabetes. The HR estimates from that study are close to those from our study (2.20 and 1.75 in people with and without diabetes, respectively), supporting the validity of our findings. Although vascular changes in the retinal vessels are increasingly seen as valuable risk markers for CHD,1–4 many of these changes require specialised equipment for their measurement. Our findings have particular relevance to clinical practice as retinopathy lesions can be readily assessed using the direct ophthalmoscope, which is already widely used and available. Although isolated microaneurysms and haemorrhages may be missed on direct ophthalmoscopy, moderate retinopathy is more readily evident and our report shows it conveys a 6.7-fold increased risk of CHD death in people with diabetes, and a 2.3-fold increased risk in people without diabetes, even after accounting for traditional risk factors such as hypertension and smoking. In summary, we report that the presence of retinopathy increases the risk of CHD mortality in people with and without diabetes. The increased risk of CHD death associated with retinopathy alone is of a similar magnitude to that associated with the presence of diabetes itself. These findings suggest that the presence of retinopathy, regardless of a person’s diabetes status, may indicate underlying subclinical vascular disease. As retinopathy lesions, particularly moderate retinopathy, can readily be identified in emergency departments and doctors’ clinics, our findings support a role for direct ophthalmoscopy to help identify people who may be at increased risk of CHD events. Such people may benefit from a thorough cardiovascular risk assessment, lifestyle changes and better management of risk factors, and closer monitoring for CHD events.
. The eye in hypertension.Lancet2007;369:425–35.
. Retinal vascular caliber and the risk of coronary heart disease-related mortality.Heart2006;92:1583–7.
. Quantitative retinal venular caliber and risk of cardiovascular disease in older persons: the cardiovascular health study.Arch Intern Med2006;166:2388–94.
. Retinal vessel diameter and cardiovascular mortality: pooled data analysis from two older populations.Eur Heart J2007;28:1984–92.
. Screening for diabetic retinopathy by non-ophthalmologists: an effective public health tool.Acta Ophthalmol Scand2003;81:373–7.
. Diabetic retinopathy and the risk of coronary heart disease: the Atherosclerosis Risk in Communities Study.Diabetes Care2007;30:1742–6.
. Retinopathy predicts cardiovascular mortality in type 2 diabetic men and women.Diabetes Care2007;30:292–9.
. Retinal vascular changes and 20-year incidence of lower extremity amputations in a cohort with diabetes.Arch Intern Med2003;163:2505–10.
. Cardiovascular disease, mortality, and retinal microvascular characteristics in type 1 diabetes: Wisconsin epidemiologic study of diabetic retinopathy.Arch Intern Med2004;164:1917–24.
. Risk factors for coronary artery disease in non-insulin dependent diabetes mellitus: United Kingdom Prospective Diabetes Study (UKPDS: 23).BMJ1998;316:823–8.
. Retinopathy predicts coronary heart disease events in NIDDM patients.Diabetes Care1996;19:1445–8.
. Retinopathy in older persons without diabetes and its relationship to hypertension.Arch Ophthalmol1998;116:83–9.
. Relation between fasting glucose and retinopathy for diagnosis of diabetes: three population-based cross-sectional studies.Lancet2008;371:736–43.
. Retinopathy is associated with cardiovascular and all-cause mortality in both diabetic and nondiabetic subjects: the Hoorn study.Diabetes Care2003;26:2958.
. Diabetic background retinopathy is associated with impaired coronary vasoreactivity in people with type 1 diabetes.Diabetologia2004;47:725–31.
. Retinopathy is related to the angiographically detected severity and extent of coronary artery disease in patients with type 2 diabetes mellitus.Int Heart J2005;46:639–46.
. Usefulness of diabetic retinopathy as a marker of risk for thallium myocardial perfusion defects in non-insulin-dependent diabetes mellitus.Am J Cardiol2001;87:456–9; A6.
. Association of carotid intima-media thickness and arterial stiffness with diabetic retinopathy: the Chennai Urban Rural Epidemiology Study (CURES-2).Diabetes Care2004;27:1962–7. Anonymous. Grading diabetic retinopathy from stereoscopic color fundus photographs—an extension of the modified Airlie House classification. ETDRS report number 10. Early Treatment Diabetic Retinopathy Study Research Group.Ophthalmology1991;98:786–806. AAO. International Clinical Diabetic Retinopathy Disease Severity Scale. American Academy of Ophthalmologists 2007.Available at http://one.aao.org/asset.axd?id = 321d1c98−7ded−45a6−b663−8edbd2ef55dd (accessed 20 June 2008).
. Accuracy of the Australian National Death Index: comparison with adjudicated fatal outcomes among Australian participants in the Long-term Intervention with Pravastatin in Ischaemic Disease (LIPID) study.Aust N Z J Public Health2003;27:649–53.
. Fenofibrate and diabetic retinopathy.Lancet2008;371:721.
. Diabetic retinopathy and systemic vascular complications.Prog Retin Eye Res2008;27:161–76.
. Ophthalmoscopy versus fundus photographs for detecting and grading diabetic retinopathy.Invest Ophthalmol Vis Sci1992;33:1888–93.
. Hypertensive retinopathy and incident coronary heart disease in high risk men.Br J Ophthalmol2002;86:1002–6. Funding: The study was supported by the Australian National Health and Medical Research Council, Canberra, Australia (grant nos153948, 302068, 974159, 211069). Ethics approval: Approved by the Western Sydney Area Health Service Human Research Ethics Committee. All authors have contributed in part or in total to the study conception, collection of data, analysis, interpretation, drafting and revision of the manuscript. All authors have seen and agree to the contents of the manuscript. GL guarantees the integrity of the data. The eye: window to the soul or a mirror of systemic health?